FLYING V ace Jeron Teng looks like he's out to prove he is more than just a scorer. Teng has been showing he has improved the other facets of his game, particularly his playmaking skills. Such was the case on Tuesday as the former La Salle star notched another triple-double with 20 points, 16 rebounds, and 10 assists in a no-bearing 97-59 win against Zark's Burger on Tuesday. 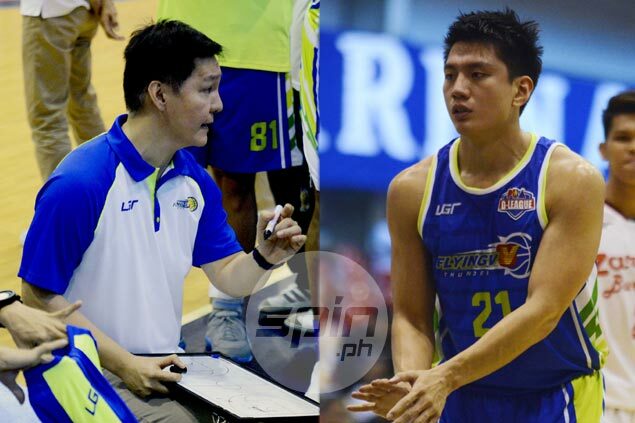 Flying V coach Eric Altamirano couldn't help but marvel at the kind of player Teng has become in so short a time. And the amiable mentor wouldn’t be surprised if the Thunder gunner, who declared himself available for the PBA draft this year, makes waves right away in the pro league. “That’s something he can always have (triple-double) when he gets into the PBA. I think he’s really working on it, ‘yung complete game niya, the other dimensions of his game,” said Altamirano. "I think it will really help him and also it will help the team," the veteran mentor added. Flying V goes for an elims sweep when it takes on Batangas on August 1 at the Ynares Sports Arena in Pasig, but Altamirano urged his wards not to get distracted from what they need to work on even with their unbeaten streak. “Hindi ibig sabihin na pasok na kami sa semis ay we will not give our best, nakita ko naman na they gave their best and that will help us especially when we get into the playoffs,” added Altamirano.